Committed Thoughts: About Stepping Stones, Sunrises. Sunflowers, and Snow! About Stepping Stones, Sunrises. Sunflowers, and Snow! When I’m in the shower, I solve the world’s problems. I have the perfect snarky response for other people’s stinky attitudes, and I have the solution to world peace. This also happens late at night in those few moments between consciousness and sleep. It is unfortunate that when I dry off or wake up, as the case may be, all those perfect solutions are nowhere to be seen. It’s the same when writing that novel…it’s all swirling around in my head until I am staring at my keyboard and monitor. Maybe one day. Until then, there's always photos! Your words are perfect. I like your S's. You have shown two natural treasures I would love to visit. I soak up history like a sponge and like walking in the footsteps of history. :D You did it! "S" made it in under the wire. I had to scroll back up and take a second look at the sunflower when I read it was in your backyard. Magnificent. We had snow a piece down the road from here this morning. :( I much prefer it in your photos. Thank ye, thank ye! There was a day or two that it was a challenge! I love that you posted about sunflowers. 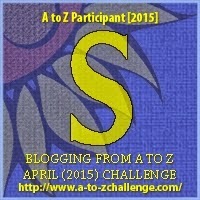 Perfect since this year is the A to Z Sunflowers for Tina challenge. LOL...and beautiful photo's they are. But, I know what you mean about solving the worlds problems. If only! Playing catch up, got your R yesterday, S now, and hope to come back later today for T and get a letter or two tomorrow...chipping away. Yes, it seems I have some very good, albeit fleeting, ideas! haha As you say, "If only!"